MONROVIA, CA--(Marketwire - Sep 11, 2012) - Dreamy, creamy, decadent hot chocolate flows for free for those who plan their holiday parties ahead at one of the premier event venues in Monrovia, CA, where over-the-top hot chocolate service is bound to attract the sweet tooth of even the most unsuspecting. Setting the pace for a heavenly chocolate encounter amidst the excitement of the holidays, self-proclaimed chocoholics and those seeking to win the other side over by first capturing the attention of their sweet tooth will find everything needed for a "holly, jolly" good time at the stylish Courtyard by Marriott Los Angeles Pasadena/Monrovia hotel. Featuring an enticing hot chocolate station that is totally decked out to offer all the trimmings for tantalizing delights, the hotel is spreading the chocolate cheer to those who book their events early utilizing the hotel's meticulous event space. Whether celebrating Christmas with company associates, planning a family extravaganza or an elegant social affair, the Courtyard is prepared to keep the hot chocolate flowing for those who book their holiday or year-end parties before October 1, 2012. Conveniently located among hotels near Pasadena Convention Center, the Courtyard is offering this unique hot chocolate buffet to help clients add excitement to holiday events and create a warm and inviting ambience around which guests can share joys of the season. As part of their ongoing holiday service, this Rose Bowl hotel's talented team of event managers and professional culinary artists has paired the free-flowing chocolate attraction with grand seasonal menus and many festive options so hosts can rest assured theirs will be an inspirational and memorable event. Dazzling guests is easy when taking advantage of the sophisticated facilities and remarkable services offered by the Courtyard. As one of the most accommodating business hotels in Pasadena, venues include over 5,000 square feet of flexible space for gatherings of up to 350 persons. Business amenities, high-speed Internet access and a comprehensive range of audio-visual equipment are offered along with customized menus to meet the needs of nearly any occasion. Those wishing to book an event and take advantage of the free hot chocolate station or obtain more information may contact the sales staff at 1-626-357-5211. 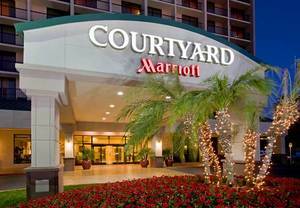 The Courtyard Los Angeles Pasadena/Monrovia hotel is nestled at the foot of the San Gabriel Mountains, welcoming travelers to the comforts of Marriott hospitality while being surrounded by the vibrant communities of southern California. Hotel features include the Courtyard Café, open daily for breakfast and lunch; the Lobby Bar, open each evening for dinner and drinks; a heated outdoor pool, and a multi-station exercise facility. All guests enjoy complimentary wired and wireless Internet access, Plug-in Technology and access to the hotel's 24-hour business center and library. Dreamy, creamy, decadent hot chocolate flows for free for those who plan their holiday parties ahead at one of the premier event venues in Monrovia, CA, where over-the-top hot chocolate service is bound to attract the sweet tooth of even the most unsuspecting.